Welcome to the Math Salamanders 1st Grade Math Subtraction Worksheets. Here you will find a wide range of free printable First Grade Math Subtraction Worksheets, which will help your child achieve their benchmark for Grade 1. Here you will find a selection of First Grade Subtraction sheets designed to help your child improve their mental subtraction skills. The sheets are graded so that the easier ones are at the top. learn how to solve subtractions where one of the numbers is missing, but the answer is given. All the free 1st Grade Math Worksheets in this section follow the Elementary Math Benchmarks for First Grade. 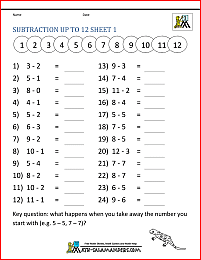 Here is our random worksheet generator for free subtraction worksheets. Subtract with numbers up to 12. Subtract with numbers from 10 to 20. These free subtraction worksheets will help your child with their mental subtraction learning. 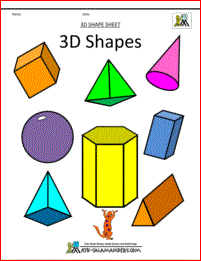 Here you will find our range of Free 1st Grade 2D & 3D Shape Sheets. The following printables contain pictures of common 2D shapes that your child should know. Each sheet is available in both a color version and a black and white version (if you wish to save on printer ink, or use as a coloring sheet). 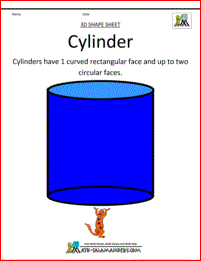 recognise a range of 3d shapes including spheres, cones, cylinders, prisms, pyramids, cubes and cuboids.